Your time is one of your most valuable assets. Let’s make sure you are not wasting it. When you are building something big, time is of the essence yet it seems like everyone wants your time. You can easily look up and be frustrated because while you are staying busy, you are not getting to the things that truly move your vision forward. I am fanatical about how to expand my time and have been studying time-management for more than 20 years. 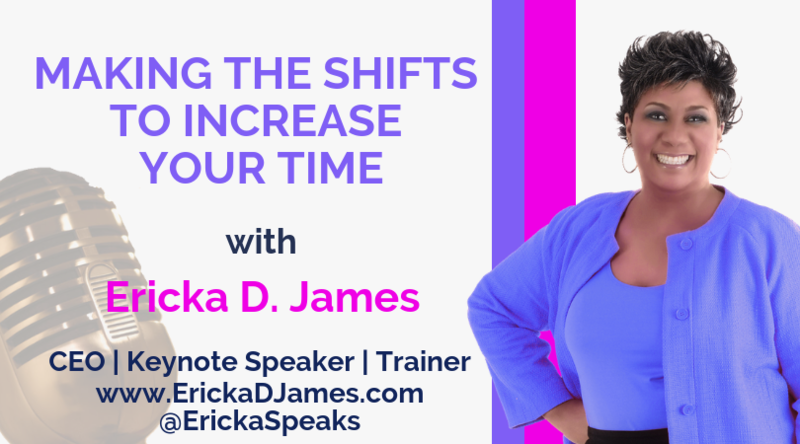 I share some keys to help you make the time-management tips that will increase your time in this video. Enjoy! Join me on Tuesdays and Thursdays for The Power Chat on Facebook Live. @ErickaSpeaks. Here is the link to LIKE the page so you can easily tune it or view a replay – https://www.facebook.com/ErickaSpeaks/.